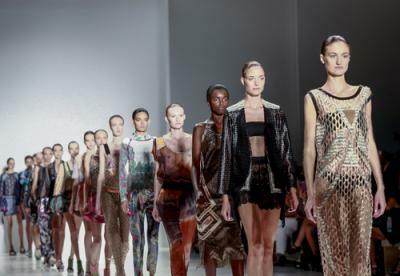 New York Fashion Week begins tomorrow and runs from Feb 12-19 at Lincoln Center. Its 500 fashion shows will give us an idea about what to wear next fall and what has fallen out of fashion. The shows are extravagant, but in fashion, nothing succeeds like excess. Manhattan streets will be filled with ladies wearing tiny shorts, stiletto boots, extreme platforms, not to mention those yellow pants favored by gentlemen in the industry. Fashion Week attracts 232K devotees each year to NYC and is serious business with $865mm in sales (snacks, hotels, cabs and the outfits off the runways). It's hard to believe, but what the tellers will be wearing next Sep will be influenced by NY Fashion Week as well. Let's face it; bankers are not easy people to dress. Even sophisticated analysts from Wall Street who follow the price action of department store shares dare not stray far from dark suits. The usual code for men is a suit and tie, and then business casual one day a week. The banker's uniform is cut in neutral colors: charcoal gray, navy blue, black. It is not the most confident choice of colors, and doesn't give a clue about one's personality. Dark durable colors have their advantages though as they are utilitarian and don't stain easily. Bankers can spill coffee and it won't show. Feminine employees wanting to show that they are equal to the men borrow their uniforms, neutral pants (or skirts) and safe shirts. The look suggests professionalism and approachability. Dark colors are functional and they hold up better all day long, but they are also boring. Customers want professionalism, but does the customer really want to work with someone whose color palette blends into the walls? Many industries are trying to balance the message: a little bit of safety but also a touch of fantasy. The auto industry is slowly moving away from beige and gray interiors. The airlines during the freewheeling '70's commissioned designers like Emilio Pucci, Oleg Cassini, Halston to add color to the lives of their flight attendants. Today sober professional outfits are back in vogue on domestic flights and business casual is ubiquitous on SW Airlines, but employees do express their originality through a scarf or a more interesting tie. Foreign airlines are known for their fashion sense, as seen when Air France attendants incarnate the French style with their multiple ways to tie a scarf. You are what you wear, so we say it is time for bankers to spice up the presentation with a flashy tie, sophisticated cufflinks or a new designer belt. Italian designers create magic with men's suits, but there are also solid American creators like Ralph Lauren and Tommy Hilfiger who know how to reinvent menswear tailoring. If you're an aspiring young woman executive, in addition to menswear inspired suits, you might try exploring your wardrobe again to see if you have something fun tucked way in the back. Go crazy, have fun and remember that not all bankers have to be boring! As bankers, our appearance should express professionalism and competence and inspire trust. Adding small elements of personality does nothing to detract from that and in fact expresses an effort to look our best for our customers and colleagues. Nothing we wear in the bank will probably make the runways in NY, but we can all probably spice up what we wear a bit for ourselves and for our clients to keep things interesting. As expected, it was a relatively calm day for the market with yields seeing less than a 1bp rise by the close. Treasury yields are currently down 2bps as the market anticipates a drop in tomorrow's retail sales numbers. A survey by Pew Research finds 18% of online adults say they have had important personal information stolen (SSN, credit card, bank account) and 21% have had an email or social networking account taken over without their permission. A survey of small businesses by Wasp Barcode Technologies finds the top strategies businesses plan to use this year to generate growth are: improving the customer experience or retention (55%); investing in new customer acquisition (45%); expanding into new markets (28%) and launching new products or services (23%). A new Wall Street Journal survey finds most US businesses will benefit from cheaper energy costs. As of year-end 2014, consumer confidence reached its highest level in 8Ys. The Fed KC reports average consumer debt as of Q3 excluding first mortgages for the US was $17,205. Community bankers should note studies find about 90% of Millennials say they are never without their smartphone and roughly the same percentage say they have already used or are open to depositing money into their bank using the phone camera. An American Express survey of US adults finds of the roughly 30% of people who hold a stash of cash savings, about 53% hide some in a secret location. A new poll by the Wall Street Journal finds about 50% of people say 2014 brought them important economic improvements and 40% said they are satisfied with the state of the economy.